Fun striped warm top for a great fall day. Super soft and comfortable. 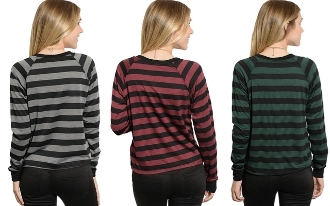 Long sleeve, great colors complimenting black stripes. 51% polyester and 49% cotton. Comes in colors: Green; Grey; Maroon. Comes in sizes: Small; Medium; Large.